Home Unlabelled ALERT: If You See A Blue Line On The Curb Outside Your House… This Is What It Means! 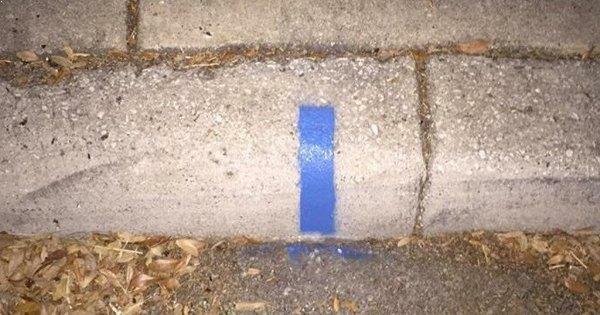 ALERT: If You See A Blue Line On The Curb Outside Your House… This Is What It Means! Have you ever heard the term “Thin Blue Line”? Typically this refers to the fact the police are the difference between ordered society and anarchy. When small business owner Anthony Welichko noticed the public turning agains the police service in recent times, he decided to take things into his own hands with this initiative. He calls the movement “The Safe Harbor Initiative,” and he posted a message to law enforcement on his Facebook page. Since making the post, it has been shared more than 85,000 times by people supporting his cause. To all law enforcement who see this line, know that the residents of this home appreciate your service and dedication to keeping the peace. Know that when you enter the neighborhood and see these lines that you are not alone or without “back-up”. We do not need the media to make our voices of support for our police and emergency services heard ( though it would be nice). Lastly, if you are in my neighborhood and mean to harm a member of law enforcement, know that decision may be hazardous to you health as someone has that officers back! We really hope you enjoyed this article and don’t forget to share it with your friends and family. Thank You and take care!